We don’t often think about the states and Canadian provinces surrounding the Great Lakes as its own economy – but maybe we should. After all, the region is tightly integrated in terms of trade. It alone accounts for more than 50% of all U.S./Canadian bilateral border trade and sees over 200 million tons of cargo shipped annually. If it were its own country, it would have a GDP of US$6 trillion – making it the third biggest economy in the world. This infographic breaks down the massive economic impact and trade partnerships that stem from the region’s prolific waterways, and the people living around them. The Great Lakes Region has always been a center of trade. From the fur trade of the 17th century to modern day, the area’s navigable terrain, waterways, and ports have made it an easy place for goods to exchange hands. The Great Lakes Region includes eight states (Minnesota, Wisconsin, Illinois, Indiana, Michigan, New York, Ohio, and Pennsylvania) and two Canadian provinces (Ontario and Quebec) that surround the five interconnected freshwater bodies known as the Great Lakes. The area is home to 107 million people, 51 million jobs, and a GDP of US$6 trillion – making the Great Lakes Economy a powerhouse on an international level. In particular, the region is well-known globally for its manufacturing prowess. It’s home to automobile and aerospace giants like Ford, GM, Chrysler, Bombardier, GE Aviation, and Magna International, and also many other diverse industries. Education and health, shipping and logistics, agriculture, mining and energy, tourism, and finance are some of the other major industries that generate business for the region. And despite having a border, the Great Lakes Economy is highly integrated. Each year, there is $278 billion in bilateral U.S.-Canadian trade in the Great Lakes area – more than the entire region trades with countries like Mexico, China, UK, Germany and Japan combined. The relationship between U.S. states and Canadian provinces in the Great Lakes Region is unique, and relies on goods flowing both ways. For U.S. companies in the region, 78% of the imports they bring in from Canada are “intermediate goods”, which are raw materials, parts and components, and services that are used to produce other goods and services in the United States. Going the other way, Canadians buy billions of dollars worth of goods from the Great Lake states as well. 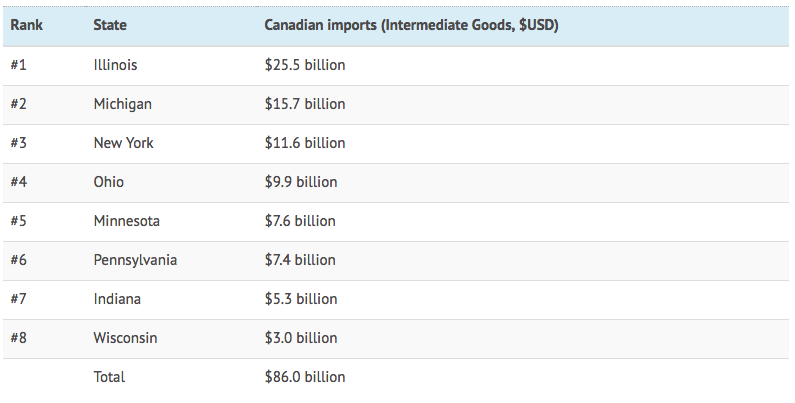 In fact, Canada is actually the biggest international customer for each state in the region – something shown in this USA/Canada trade infographic as well. Although rhetoric against the U.S./Canadian trade relationship has ramped up in the recent months, there is still one enduring symbol that exemplifies the intimate trade relationship of the two countries in the Great Lakes Economy: the Ambassador Bridge between Detroit, Michigan and Windsor, Ontario. Each day, over this one 1.3 mi (2.3 km) suspension bridge alone, close to 10,000 trucks pass to generate close to US$500 million of international trade between the two nations. That’s equal to 25% of all bilateral trade between Canada and the U.S. Amazingly, more bilateral trade happens over this single bridge than the U.S. does in its entirety with France, Germany, South Korea, or the United Kingdom.